-- Select a Size -- Large - 16.5" - Out of Stock! 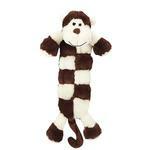 X-Large - 28"
Our Grriggles® Safari Squeaktacular Monkey Dog Toy has a dozen or more squeakers inside for a riot of fun! Lots of squeakers inside equals lots of fun with our Grriggles® Safari Squeaktacular Dog Toys. This Monkey plush dog toy makes satisfying squeaking sounds and makes playtime more exciting – sure to keep dogs entertained for hours. The long, flat body shape is great for pulling and tugging games. Dogs will delight in the soft plush toy with a dozen or more squeakers! Available in two sizes, each sold separately. Prompt service, wide variety of products.